Philemona Williamson creates narrative images in which she makes a kind of visual poetry, investigating the lives of adolescents of all races and genders. 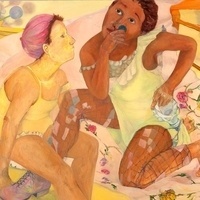 Her work has been shown in many one-person and group exhibitions throughout the United States and abroad, including the IV Bienal Internacional de Pintura en Cuenca, Ecuador, SUNY College in Old Westbury, NY; the John Michael Kohler Arts Center in Sheboygan, WI, the African American Museum in Hempstead, NY; the Queens Museum of Art in NYC, the Montclair Art Museum and The Bronx Museum in NYC. Opening Reception: Thursday, September 13, 7:30 - 9 p.m.